Bette Midler's New York Restoration Project (NYRP) 2006 Hulaween Auction includes a piece of limited edition artwork by Stevie Nicks. 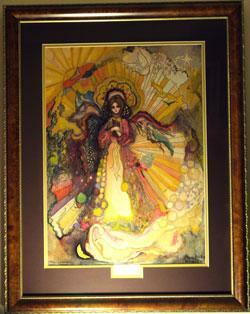 "The title of this drawing, done by Stevie Nicks, is Rhiannon. Although she has thirty pieces of artwork, this is the only piece she considers finished. This rare jewel was completed in 1982 as a tribute to her close friend Robin who lost her battle with Leukemia." The auction is scheduled to close November 10, 2006. Stevie Nicks is listed on page 2 of my celebrity artists list.